Today we had a visit from the Kids 4 Drama group who shared a show about the importance of caring for our environment. Their message of Reduce, Re-Use, Recycle challenged our students to think about how we respect and look after our environment. The show was sponsored by the local councils and enjoyed by students. This show made me think twice about how I treat and look after the environment. Yesterday we had some special gust from Auckland for drama for helping Hasting to save it for the future. I lean that we need to keep our school tidy so it doest go out to sea. 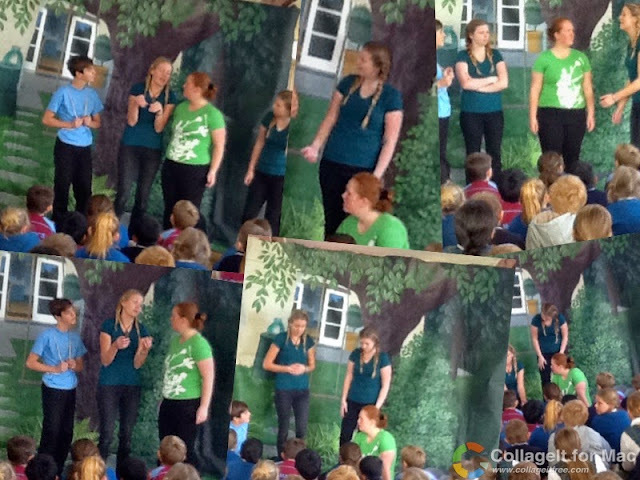 The Waste Wise Show told us lots of ways to save our Earth, Air, Water and Power and that every little bit makes a difference. I found this show awesome! It really gave me something to think about - how I treat the environment. One of the many things I learnt was outside drains only drain rain! I wonder if they will be back? Wow that show yesterday was great that show would now probably be my new favourite show that I have seen because that show was the best and the actors were like teenagers and one adult. This show was very entertaining and very educational. I learnt that buying things in bulk instead of little individual bottles or wrapping is better for than environment, for example: Buying big bags of chips instead of lots of little one reduces our waste. This was an awesome show that really me and made me think about how we respect the environment. One of the message they used that I really liked was "Clean and Green". Today was a great performance about waste wise. I loved how they didn't use big adult words and that it wasn't hard to understand. I learnt how water drains are only for rain water not for anything else. I am going to tell dad to wash the car on the grass from now on. I really enjoyed how the characters came out of a video game that was so funny. I think I will do some things differently now. The show that we saw I think taught everyone what happens when you just drop rubbish on the ground that it effects quite a lot of things. It was a good show. I learnt to not to clean your car on the drive way. You need to clean your car on the grass so the soup will go in to the dirt to let the grass grow. This drama production was really inspiring to our school.I learnt the outside drain only drain rain and if you wash your car, wash it on the grass because the grass absorbs all the soap and water and is good for the soil and No the worms wont die they just move away from the soap. I enjoyed this show heaps because it got really good messages into my head. Because of this waste wise show I now know that if you drop you rubbish it can end up in a local river and can damage the fish's. They also talked about how cars can damage the air and having a worm farm or an environment centre can help the air as well. One of the reasons they came was to tell us that l we should look after our earth and to do the right thing for it. They were amazing to watch and it was very humorous at times. They taught valuable lessons that we should carry out through our day to day living. I would be happy to watch them again.